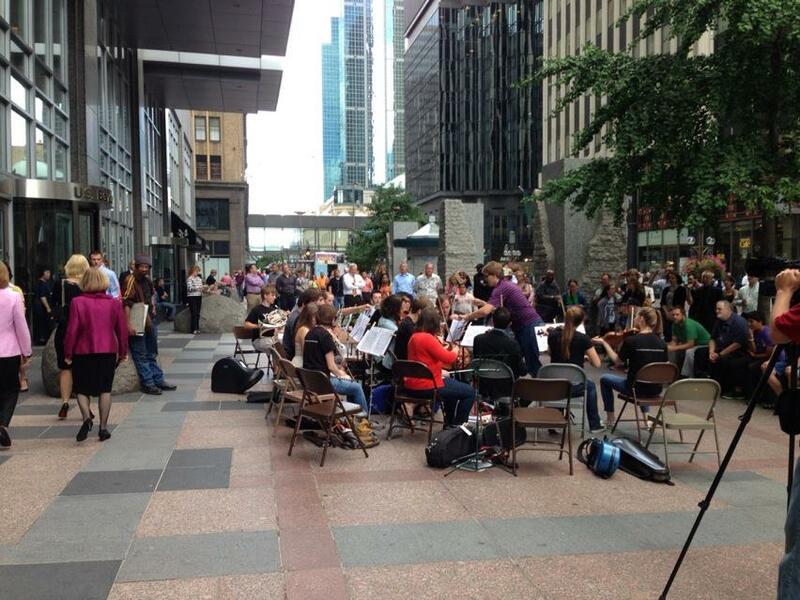 Yesterday was quite the day: the Young Musicians of Minnesota made metro-wide news. Yeah, unbeknownst to the locked out Minnesota Orchestra musicians, the Young Musicians of Minnesota brought their instruments to Nicollet Mall to play a concert of Tchaikovsky 4 in front of US Bancorp. Their mission? To send a message to Richard Davis to end the lockout of their mentors and heroes. YMM members deliberately didn’t tell the musicians what they were up to. I’m sure there are rumors floating around the upper floors of US Bancorp and Wells Fargo that those damn musicians put ’em up to it, but to believe that would be to succumb to the worst kind of cynicism. (Hear that, Minnesota Orchestral Association monitors? Good.) Sadly, Richard Davis didn’t acknowledge the crowd, nor did he send anyone down to say hello, but they did get an awful lot of attention on the Mall. I couldn’t be there, but I was tipped off about the show beforehand, and so I shooed some dedicated Twin Cities Larkers to downtown Minneapolis, and I heard a couple reports of how the afternoon went. Well it turns out there was press there, and US Bancorp couldn’t really do much about any of it except watch uneasily and talk to people on cell phones. Consequently the following three videos aired last night on KSTP at 4:30, 6, and 10. Kudos to YMMer Emily Green, who has more composure in a major interview than any other teenager I’ve ever seen. I did notice, though…. There’s something in the first video that got snipped out of the second two. See if you can spot it! In case you’re wondering, I’m still alive. Just haven’t had much to say, since nobody else has much to say. One hopes some kind of negotiations are happening behind the scenes. Not holding my breath on that, though. 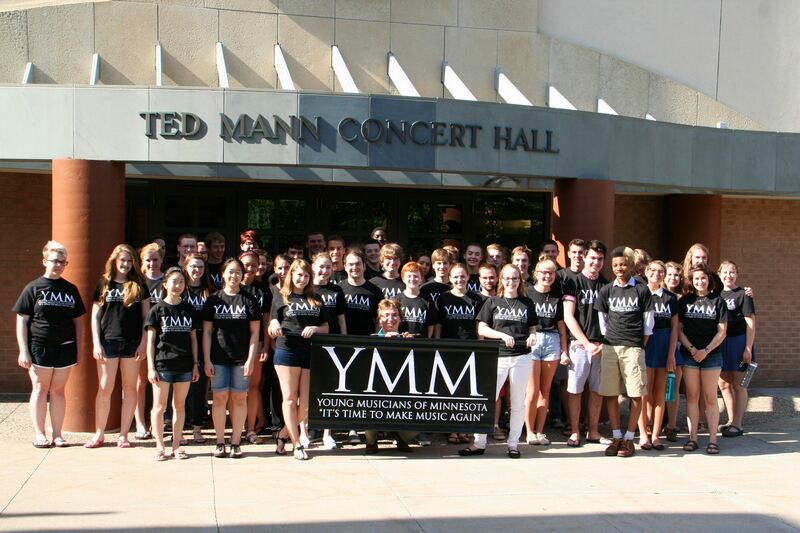 Nonetheless, I wanted to mention that the Young Musicians of Minnesota are giving a concert on Saturday July 27. All details here. The program includes the feisty, rebellious Beethoven Egmont Overture and Tchaikovsky 4, as well as Mahler’s Adagietto. They’re still looking for string players to help fill out the section. So if you’re a musician around 25 or younger (or know any musicians around 25 or younger), check out the details in the link. More concerts are in the works. Check out their Facebook page for updates. And you are checking the musicians’ Facebook page every day, right? Good. For many centuries, authors have written about the imminent death of orchestral music. The topic takes on a special urgency during economic downturns, labor disputes, and times of societal upheaval. The cause of death varies. Nonetheless, a refrain emerges: young people are apathetic about the loss. The conventional wisdom goes something like this… We attended schools that didn’t offer the musical education our parents received. Most of us listen to a lot of music on a variety of devices rather than listening to it live. We text and Tweet, and therefore don’t have the attention span to devote to Mahler. We can’t remember a time when we could watch performances of orchestral music on the major networks. (Actually, most of us have difficulty imagining a time when the major networks were relevant…) We don’t have the money or the stability to commit to the subscription packages that make up the reliable core of an orchestra’s ticket revenue. We’re not always interested in traditional forms of delivery of orchestral music. We don’t go to as many concerts as we could or probably should. All those points have a certain validity.